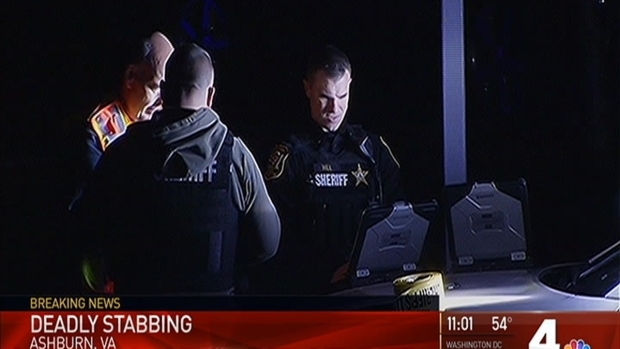 Police at the scene of the stabbing in Ashburn, Virginia. Two teenagers are in custody in connection with a fatal stabbing last week in Virginia, the Loudoun County Sheriff's Office said. Guillermo Piedra-Espinoza, 22, was found dead in a wooded area near the Ashburn Meadows apartment complex after the sheriff's office received a call about a bloody 19-year-old man seen coming out of the woods about 6;15 p.m. Nov. 4. Both men had been stabbed, and the 19-year-old was taken to a hospital for treatment of serious injuries, according to the sheriff. A 17-year-old from Ashburn was apprehended in New York Wednesday and is being held on an extradition warrant for aggravated malicious wounding, according to the sheriff. A 16-year-old from Herndon was taken into custody Thursday and is being held in Fairfax County on an unrelated charge. Additional charges may be filed against the teens. One man was found stabbed to death and another injured near an apartment complex in Ashburn, Virginia. News4’s Darcy Spencer reports police are still searching for suspects. The victims appear to have been targeted, according to the sheriff. The sheriff's office is working with the Northern Virginia Gang Task Force on the investigation.